Have you ever been to a favorite things party? I’ve been to just one. For those of you who don’t know, it’s a party where each guest brings a certain number of one of their favorite things. This is usually just a $5 item or less, like a favorite candy bar or gift card to a great coffee shop. Then everyone swaps with other guests, and you leave with five or so of your friends’ favorite things. Last spring I went to this party, and I sat enthralled as each of the women in that living room went around and explained what favorite thing they brought and why she liked it so much. Each item was a tiny window into that person’s personality and life. People brought everything from dry shampoo to cups full of limeade (yesss) to a sweet syrup brought all the way from Germany. It was fun, but I was sad. Why? Because I had no ideas about what to bring to that party. How sad that I couldn’t think of any small thing I really liked! What was wrong with me? Since that night, when I brought an assortment of not-very-special notecards from the dollar bin at Michael’s to a favorite things party, I’ve been keeping tiny lists around me–in journals, on my phone–of my current favorite things. Because if it’s the little things in life that mean so much, I should probably be aware of those little things. I’m happy to tell you, I recently got to ten items on that favorite things list! Success! That’s when I saw that Modern Mrs. Darcy is hosting a Things That Are Saving My Life blog post link up related to all the things that are getting us through this winter. The timing…wow. Plus, I royally hate winter. Now is the time I can finally share those things on my list! And they are absolutely all saving my life this winter. Mary Kay Shea Butter Satin Lips Balm + Blistex Orange Mango Blast – I just discovered the shea butter balm four days ago, and it is awesome. I put it on in the morning, and don’t feel the need to apply any kind of lip balm ’til the evening. Yes, it lasts that long. However! I couldn’t give up the citrus smell of the Blistex Orange Mango Blas. The citrus smell of this chapstick right under my nose eases pregnancy-related nausea a good bit. That nausea has kicked in again even though I’m in my third trimester because of heavy doses of iron supplements and prenatal vitamins. So this is my one-two chapped lips + nausea punch. If that doesn’t make sense, just go for the shea butter. It really is lovely. Neutrogena Grapefruit Cleanser – Are you sensing a theme here? I promise, not all of my favorite things are citrus related. I’ve been using this cleanser for about 10 months and it’s awesome for my skin, which is neither oily nor dry but prone to break outs. I don’t use it as directed, though. Instead of wetting my face first, I rub a dime size blob onto my dry face, brush my teeth, and then wet my face and scrub it around a little bit before washing it off. (I learned to do this and why in the very informative book The Acne Cure.) While I still have a blemish or two occasionally, I do not get “breakouts” or dry skin. And this cleanser does smell nice. The Bunny Clock” – This gadget has been saving my life for the last three years. You could take all of the other items on this list from me, but not this one. I would weep. When our second born was almost two, he would get out of bed as early as 5:30 in the morning, and be up for the day. As Dame Judi Dench announces in Pride and Prejudice, “This is not to be borne!” So we found this thing (I can’t remember how), ordered it off of Amazon even though it was a whopping $50 at the time, and never regretted it one iota. It is worth its weight in platinum. If you have a small child that you’re struggling to teach to stay in bed until a decent hour in the morning, I cannot recommend this clock more. Blendtec Classic 570 – I’ve never had a blender before that costs more than $40. When our third cheapo one in ten years died, I decided it was time to do some research. My husband and I found reviews stating that Blendtec blenders work very well, almost comparably to a Vitamix or one of those $400-600 ones, but for about half the price. Then my very savvy husband also found a thread on slickdeals.net informing shoppers that TJ Maxx had recently been selling them for $150, brand new. Hello, bright red Blendtec on my counter, and thank you very much TJ Maxx! The smoothies I’ve been making since getting this blender are ten times better than any I’ve made before, which of course means I’m gulping down more fruits and veggies than ever before. If that isn’t a good winter blues beater, I don’t know what is! And my favorite smoothie recipes can be found on Monica Swanson’s site. They are delicious. The little ones using my beloved throw early one morning. Spiral Notebooks – I adore spiral notebooks. I have been scribbling in them for over fifteen years. I write to-do lists, schedules, project plans, reminders, blog ideas…everything. Yes, I know there’s an app for that. But I am a pen to paper girl, despite writing a blog, and I can’t do without the process of putting my thoughts through my pen with my own hand. It transfers them from obscure to concrete. My Treadmill (which is no longer in production) – Got my treadmill eleven years ago with my first paycheck after college. Loved it. Left it. Or, I should say, had to give it away because we downsized homes five years ago. As blessed providence would have it, right when we were moving into a larger house, our friends we gave it to were downsizing themselves. It is mine again! 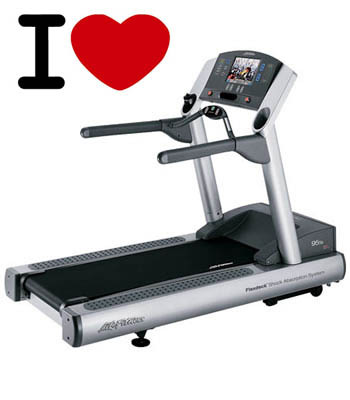 I know it may seem fake to say you love your treadmill (Hey, you’re being unreal! No one loves a treadmill! ), but I really do. I love walking or running (when I’m not pregnant) on it and listening to audio books on Overdrive or podcasts on Stitcher. I love feeling my body working hard. I love that I can use it at night after the kids are in bed. Do I prefer the outdoors? Most days, yes. But being able to take a good, uphill walk without leaving the house is invaluable at this stage of life. I am a much happier mother and wife when I am getting exercise. I guess you could say this thing is saving my whole family’s life this winter. Of course, there are three “things” always saving my life that I felt too obvious to name: coffee, library, husband. And it doesn’t hurt that we’ve had a slew of 70-degree days this past month. (Now’s the time when readers everywhere say, “You have no right to hate winter! No right!”). But 50-degree highs and rain are coming back this weekend, and I will be relying on all these things to see me through February. What’s on your lifesaving list this winter? I LOVE my heated blanket too, also a gift from my husband. I think he’s caught on that I’m always cold in the winter! Isn’t it awesome? Like a warm bath but better because you stay fully clothed. I absolutely love your list! Method cleaners are my favorite too. I switch between grapefruit and cucumber, and I adore the peppermint glass cleaner. Also, the blender! I got a reconditioned Vitamix two years ago and it was a life changer. I actually enjoy using a blender now, instead of whacking it and wanting to say bad words every time I tried to make a smoothie. Your article really got me thinking. What are my favorite things? I will have to start a list of my own. I think first might come those cute tiny clementines that are for sale all winter. There’s something about citrus in winter, like it’s God’s gift of sunshine to us in a dark, cold season. Yes to all things citrus! I’m currently adding a recipe for Lemon Dill soup Shauna Niequist included in her book Savor to my week’s meal plan. I think my kids will hate it, but I can’t resist. I’m going to have to try the cucumber Method cleaner, too!